http://www.jewishworldreview.com | The architecture of the ancient holy Tabernacle is set down in this week's Torah (Bible) portion. Among its appurtenances is the Table, covered with pure gold. It holds lechem panim, typically translated "show bread" (Exodus 25:30). I confess, I don't know the difference between "show" bread and "non-show" bread. Lechem means bread  simple. Panim, however, connotes "face" and "inside." Panim has a double meaning, each the opposite of the other. The face of something is that which is displayed ("shown") to the outside world. The inside of something is that which is hidden from the outside word. Panim is both outside and inside, the revealed and the concealed. Perhaps the timing, arrangement and timing of this mysterious, meaning-laden bread unfolds its meaning. Twelve loaves of this bread are placed on the Table, in two stacks of six, each Sabbath day and remains there all week long. Miraculously, it remains fresh all week long (Menachos 96b). Each loaf is huge, baked with 86.4 eggs. On this bread is placed pure frankincense. Each Sabbath eve, 12 new loaves are baked, and each Sabbath the old loaves are divided among priests in the Tabernacle (later, the Temple). The pure frankincense is burned on the Alter (Lev. 24:5-9). "It shall belong to Aaron and his sons, and they shall eat it in a holy place; for it is most holy for him . . . an eternal decree" (Lev. 24:9). Eternal for the priests  but not limited to the priests. For the rest of the Children of Israel, this bread is an "eternal covenant" (Lev. 24:9). This mysterious bread is eternal, covenantal, "outside" and "inside" simultaneously. 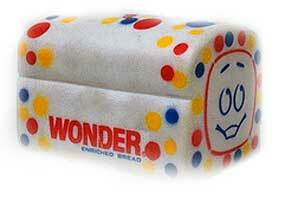 In truth, this bread is not mysterious. Every human face projects an inner being. Every human face tells a complex story. Facial features  eyes, nose, smile, cheeks, lips, forehead, chin  are physical. Within this very physicality resides the spirit of the human being. Prosperity is outside and inside, a product of human effort, yet also a mystery. Only the very young or the fool believes that his efforts or his wisdom alone fructify his life. With 12 loaves on the Table G-d blessed the Jewish nation. These loaves did more than symbolize prosperity; they were its instrument. Prosperity had a face, an "outside": bread that miraculously stayed fresh. Prosperity also had an inside, a cause beyond any human measure, a mechanism beyond human effort  a Divine flow. I am obligated to work my hardest; also, to know that my work, if blessed, is blessed from Above. The source of my success, if that it be, is He who sees but is not seen. The Torah termed lechem panim, the outside-inside bread, one of the "fire offerings of the L-rd" (Lev. 24:9), even though it was not consumed on the Altar; for after this bread was eaten, it resembled the human being's best efforts. It became hidden, invisible, unseen. Only the holiness of the prescribed acts of baking, displaying and consuming this bread remained.